Herbal Mood Support is a potent blend of antioxidants, adaptogens, and amino acids that naturally support your body’s ability to react to everyday stress, helping ease its harmful effects. HERBAL MOOD SUPPORT IS NOT DESIGNED TO TREAT DEPRESSION OR ANXIETY, AND SHOULD NOT BE TAKEN INSTEAD OF EXISTING MEDICATIONS. PLEASE CONSULT WITH YOUR HEALTHCARE PROVIDER IMMEDIATELY IF YOU ARE EXPERIENCING FEELINGS OF DEPRESSION OR ANXIETY. But if you want to help support your body’s ability to manage the normal daily build-up of stress — Herbal Mood Support is for you. Taking it every day could lead to increased mental energy, reduced “stress cravings,” and a more balanced mood and improved attention span. 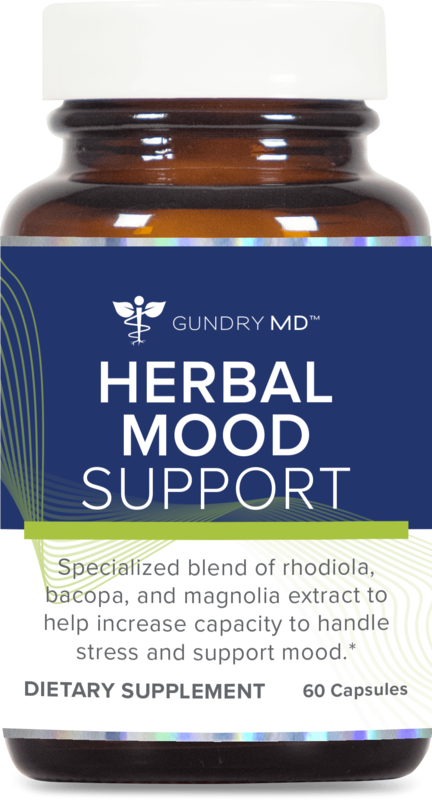 Gundry MD Herbal Mood Support is ideal for anyone who wants to maintain a healthy, happy, and balanced mood all day long. I know how stressful the average day can get — and this formula is specifically designed for people who want to naturally feel calmer and healthier. How pure is Gundry MD Herbal Mood Support? Gundry MD Herbal Mood Support contains only natural, pure ingredients. Here at Gundry MD, we pride ourselves on the purity and potency of our formulas, so every product we make undergoes extensive testing at independent, 3rd party labs. I really enjoy this product. It has been a very big help in keeping my mood stable even when facing a great amount of stress and changes in my life. I would recommend this product.